Located in the western suburbs of Chicago, The Institute for Stress Control is a private practice that provides comprehensive psychological services to children, adolescents, adults, and couples. We welcome you to our office and appreciate the opportunity to be of assistance to you. The information on our website is designed to give you a sense of who we are and how we work. We want you to know about our general office policies and methods of practice so that we can better serve you. Higgins and Moseley Waiting to Say Hello! 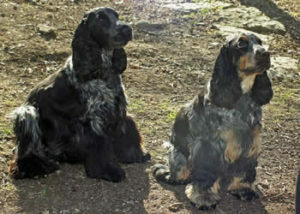 Incidentally, you may meet one or both of our office dogs: Higgins (left) and Moseley (right), English Cocker Spaniels. They are very friendly dogs; however, they understand that not everyone loves dogs as much as we do. If you or your child are one of these people, please notify us when making the appointment. Higgins and Moseley will be happy to schedule other activities for that hour.